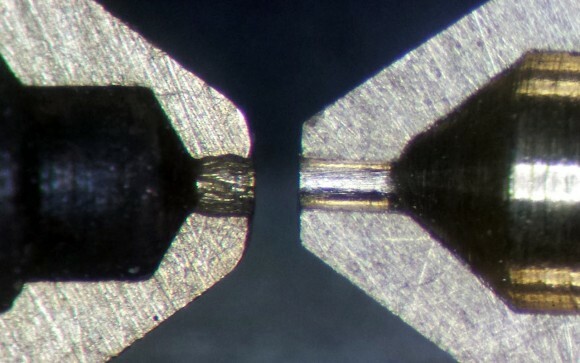 The guys at E3D have published an interesting article with information regarding the wear level of standard brass nozzles used in most FFF/FDM 3D printers nowadays when printing with abrasive filaments. They have made some tests using the ColorFabb XT-CF20 carbon fiber filament printing it with a standard brass nozzle and then with a new hardened steel nozzle that they are now offering as a great solution to working with abrasive 3D printer filaments. It seems that a standard brass nozzle can get pretty worn off after printing just about 250g of ColorFabb XT-CF20 3D printer filament as you can see on the photo above (left is brass nozzle, right is hardened steel nozzle). As a comparison the hardened steel nozzles they are selling do not show any notable wear even after printing 10 times more abrasive filament. So if you are using more exotic filaments that contain more abrasive elements in them, then you should really consider going for a more abrasive resistant nozzle. Unfortunately the hardened steel nozzles being sold by E3D are designed for the extruders that they are also making or other similar models, so if your 3D printer uses a different extruder you should look for alternatives. The solution to the wear of the nozzle we have found out to work well for the MakerBot Replicator 3D printer that we are using is in the form of specially coated nozzles from a company called AVN Swiss (now apparently renamed to Micro Swiss) and we would recommend to get not only a nozzle, but the thermal barrier tube they sell as well. Earlier this month we have tested the same ColorFabb XT-CF20 carbon fiber filament that E3D used and after printing about 200 grams of it with the specially coated nozzle from AVN Swiss we did not notice any wear on the nozzle and we have used it with other abrasive filaments prior to that. So MakerBot Replicator 2 and other MakerBot users as well as ones that have a clone 3D printer to check these upgrade nozzles or even better the whole hotend upgrade.